The smartwatch era has done nothing so much as renew my interest in real watches, which have their own type of special intelligence, albeit laid out in intricate arrays of gears and springs rather than written in silicon. Few watchmakers express this intelligence site so wonderfully as Nomos Glashütte, the German manufactory that produces exquisite timepieces with house made movements in distinct, signature cases. 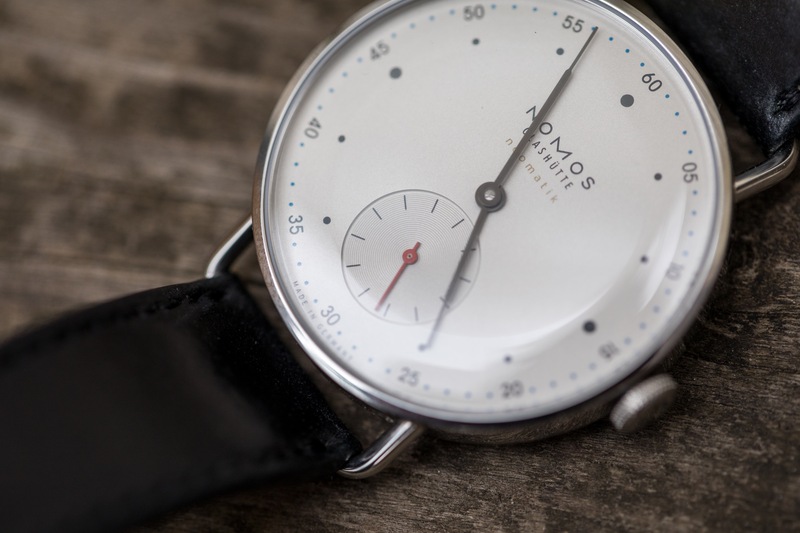 Nomos’ Metro neomatik is especially representative of the brand, with a relatively new movement for the company, which manages to offer a self-finding rotor in an incredibly thin mechanical package, meaning you never have to charge or worry about replacing batteries, but still get a very low profile on the wrist. It’s also very small in diameter relative to most contemporary watches, with a 35mm diameter that also adds to its understated appeal. The white silver-plated face features small, 60 second markers at the hours, and a subset dial with inlaid textured concentric circles shows the seconds. The minute markers are tiny blue-hued dots and the brand mark is set just above the hour and minute hands. Overall, the dial feels modern thanks to its choice of solid, minimal sans-serif font and a general preference for white space over decoration. While the Metro neomatik features a small overall diameter as mentioned, I found that it actually wears larger than the numbers would lead you to believe. The very thin bezel and the classic, retro-style lugs lend to this effect, as does the relatively thin 17mm Horween leather band. The diminutive, knurled crown on the right side of the face also gives prominence to the face, and the closeness of the hour markers to the outer edge of the face also help give it a larger look than you might expect. On the Metro neomatik’s reverse, there’s a sapphire crystal display back, which reveals the DUW 3001 in-house caliber created by Nomos. The movement itself is only 3.2 mm tall, which is why the Metro can achieve an 8.06mm overall thickness, including case and front and back sapphire glass. Detailing on the movement, including the finish on the rotor and the rest of the visible surfaces, as well as the tempered blue screws, make the work that goes into the hand-built custom motor easy to appreciate. 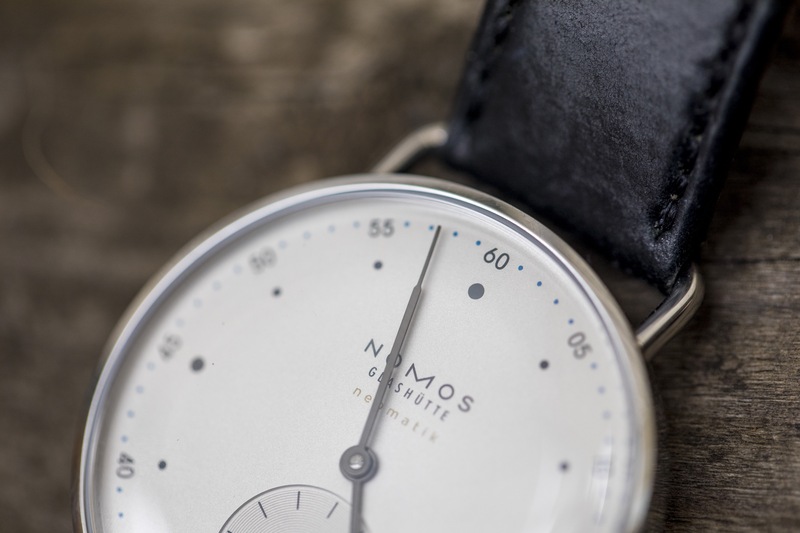 Nomos Glashütte is a watch maker for a very specific type of appreciator, and the Metro neomatik might be one of its most representative offerings in terms of speaking to that audience. 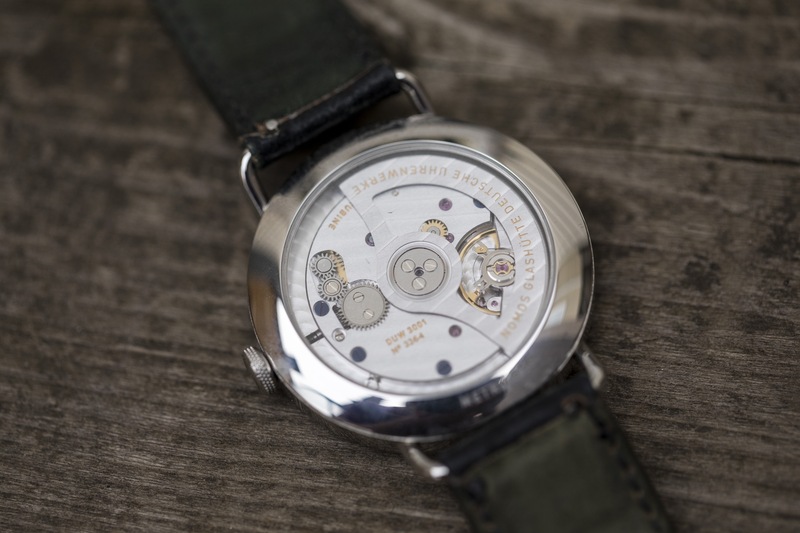 It’s a significant purchase at $3,840 USD (which includes shipping, and taxes), but it’s a relative bargain among high-end manufactory watches, and it’s unique in terms of its design appeal and its underlying technical achievement. The Metro neomatik is a great example of why there’s still no substitute for a finely made watch in a world when many fashion brands are chasing the carrot of “wearables.” Technology has a place on the wrist, sure – but it’s hard to make a case for busy, buzzing software on power-hungry, tiny displays when tech like this is the alternative.